Hymer’s Vans are back. And, on the evidence of this 314 model, they’re shorter than ever before. The pictures don’t really show it. And that floorplan diagram in the data panel below offers few clues. But, the 314 here is really diddy – at 5.45m from bumper to back panel, it’s even shorter than the 6m that seems to be the norm for a typical panel van conversion these days. It’s that crucial bit narrower than a standard coachbuilt motorhome, too, which again adds further to the appeal, if not the space inside. So why would you want it? Well, unlike a van conversion, it’s made using Hymer’s highly-rated PUAL (it was introduced in 1978, decades before other manufacturers got on the timber-free bandwagon). That gives it a far superior insulation than any van conversion can provide. It will prove easier to park than any other “full-size” motorhome, of course. 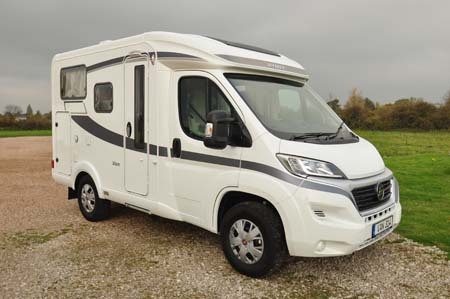 Plus, that winning combination of Fiat Ducato cab and Al-KO chassis, which helps to push the wheels out to each corner, promises excellent road behaviour by motorhome standards. 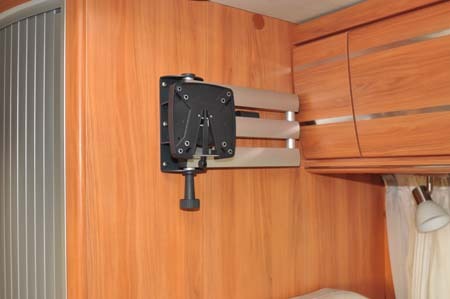 Note also, the Fiat base comes with Traction Plus and Hill Holder, as per all current Hymer products. But, it’s the Comfort-Line Package that really needs to be a starting point as far as optional extras are concerned. It provides cab air conditioning, cruise control, colour-matched front spoiler, window with flyscreen and blind to the habitation door, overcab sunroof, larger (85-litre) compressor fridge, second 95ah leisure battery and 18amp charger upgrade. The floorplan actually holds few surprises. It’s one you’ll get in other Hymer (as well as plenty of other manufacturer’s) products, although it should be no surprise to hear things are just a bit more cramped. 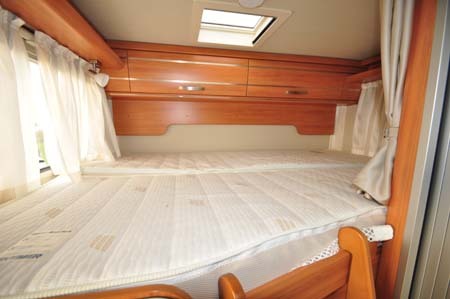 Nevertheless, that permanent rear bed across the back is some 2m long and 1.45m/1.30m wide. You’ll need the ladder provided for access, but if that really is the issue the Hymer brochure points out a lower bed can be ordered which, in turn, will compromise storage in the garage below. As here, though, that garage is a more than useful size with a decent 350kg of the total 985kg payload to itself. Also, from a huge list of optional extras, as well as packages, features like the rear hatch really should be considered. 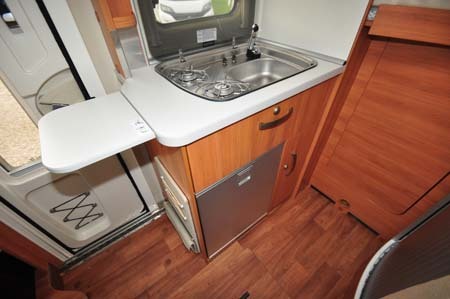 Kitchen facilities are more in line with a camper than a coachbuilt. There’s a combined two-ring hob and sink, plus 85-litre compressor fridge. The flip-up worktop extension could well come in handy, although the lounge table is nearby. The lack of a grill and/or oven helps free up storage room, and the drawer and locker space – such as it is – is actually impressive. Actually, overall storage is far better than it has any right to be in a vehicle so small. The wardrobe is under the bed, and there’s a good array of high-level lockers. It will certainly outperform any van conversions in this respect. 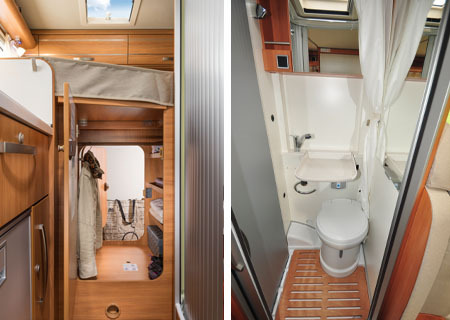 Probably the most contentious feature of this Hymer is in the washroom. The sink is a space-saving flip-down design, but it literally isn’t designed to hold water – instead it drains straight away. It’s a small room alright, but again the quality of the fittings is admirable. 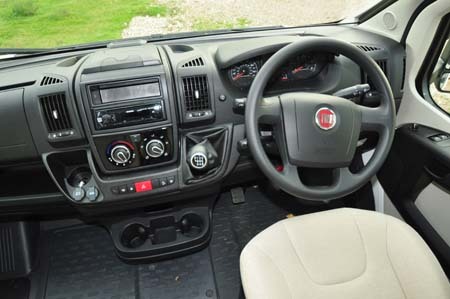 It might be a proper four-seater for travel, but on-site it translates into a very small lounge, despite a handy extension to the table and an opening sunroof over the cab that does its best to let lots of light in. Best thing in a small package, then? Only you can determine if you can live in such confines, but there’s no doubting the quality here. As for rivals, they all fall short… or long, depending on your perspective. 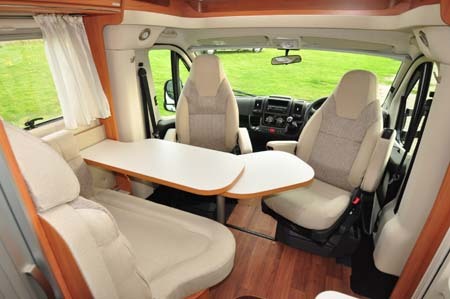 There’s more information on the Van 314 on the Hymer website (www.hymer.com). To find out more about our low-cost premiums visit the motorhome insurance discounts page. 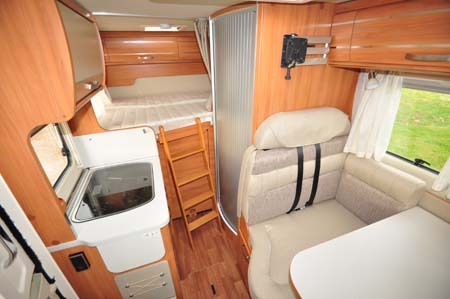 *Motorhome insurance cost based on Hymer Van 314 retailing at £42,250 with standard fit equipment and Thatcham Cat 1 alarm. UK travel only. Kept on driveway at home at TD9 8ED. Motorhome owners – professionals over 50 years old with no claims, convictions or health conditions in last 3 years. 4 years no claims bonus mirrored from car policy and 2 years motorhome driving experience. Members of motorhome club doing less than 5000 miles annually. £300 excess applies. Premiums include insurance premium tax at 9.5% and are correct at 17.12.15. This is impressive model, Just a question. if lower-bed is selected, still remaining the garage space right ?? Just smaller but same access ?? I see rear-luggage door only can be selected if the bed is high, for lower-bed option still able to access from sides of RV ? We’ve checked with a Hymer dealer and there is no rear door on the low bed 314 van. The side doors are also shorter. Everything except the hob which we would need.